Blurb: The last thing Mia remembers is the music. After the accident, she can still hear it. And she can see her damaged body being taken from the wreck of her parents' car - even though she doesn't feel a thing. 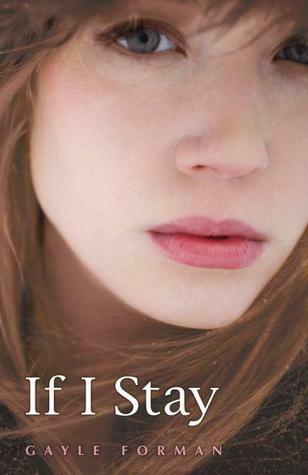 Review: If I Stay is one of those books that I’ve only ever heard good things about and in a similar fashion, Gayle Forman is one of those authors that I’ve never heard a bad review of. This book has won so many awards that I felt like it was about time that I finally read it, especially after I’d picked it up and put it down again so many times. I knew next to nothing about this book. I knew it was contemporary teenage romance and that it had a sequel and that was literally where my knowledge of this book ended. I’d seen it so many times on Goodreads- as recommendations, in the ‘readers also enjoyed similar books’ section and in so many different lists and I’d added to my ‘to-read’ list but I didn’t really know what it was about. I was expecting a little bit of story setting- the usual life before the big event sort of thing, but it pretty much gets into the main issue of the book straight away. I loved how quickly everything happened and how it was written as it made everything work really well. For a while, the main character Mia (and therefore, you as a reader) is a little bit unsure about exactly what has happened which adds to the tone of the book perfectly. I loved how you weren’t told everything that happened in one go, but how the past and present mixed together to paint a clearer picture. I loved reading from Mia’s point of view and I especially enjoyed reading about her love of music and how that all related to her family and her relationship with Adam. I loved Adam as well- I was worried that he was going to turn out to be a horrible boyfriend or something but he didn’t. He was honestly the sweetest human being alive and I loved how it was clear to see how much he cared about Mia and how far he was willing to go for her. I think one of my absolute favourite things was definitely the ending. It just- wow, it broke my heart and had me sobbing. I can’t wait until I can read the sequel- I really hope I enjoy it just as much.